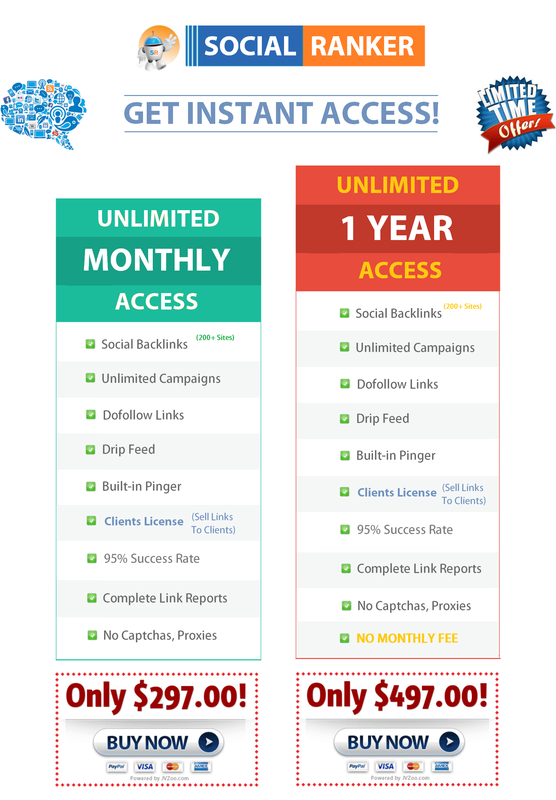 Now You Can Build Unlimited Social Backlinks Within 2 Clicks - No Captchas - No Signups! Social Backlinks - 200+ Unique Websites! Unlimited Campaigns - NO LIMITS! Whitelabel Reports - For Yourself & Clients! 95% Success Rate - For literally ANY URL! Built-in Pinger - Click & Done! 100% Automated - No Captchas, No Proxies! Get Access To Social Ranker & Dominate SERPs! Social Ranker is the First Ever - 100% Automated Web-based Social Link Building tool which allows unlimited link campaigns. Sign up & start adding campaigns right away from the members area. It's all web-based, nothing to download or install. 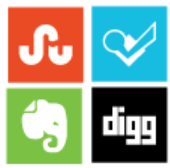 Get backlinks from over 200 high authority social websites within two clicks. Social link building was never THIS easier before! 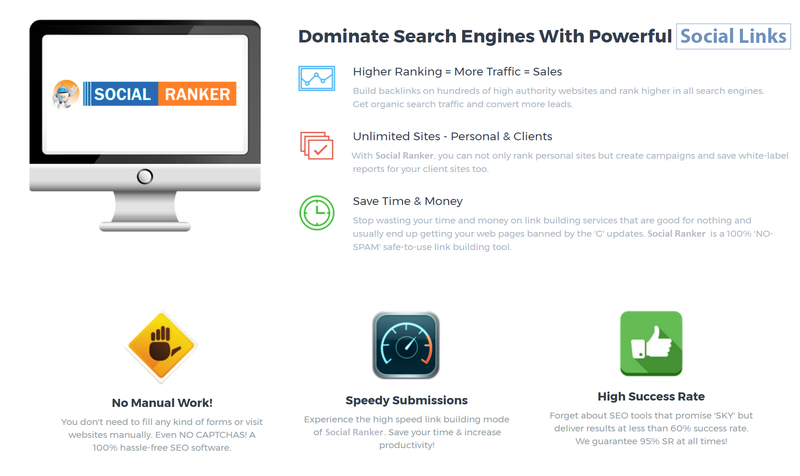 Social Ranker allows unlimited link building campaigns with 95% success rate unlike our competitors... we want you to take advantage of these powerful social sites without limits! You can add different URLs and spread links over multiple pages of the same website as well as Tier 2 URLs/links. Doing this will equally benefit all your website pages or Tier 2 links and make your SEO campaign look more natural. Social Ranker has taken link automation to the next level with automated signups, captcha solving, proxy usage, and detailed reports. Just sit back and watch as the social magic happens! Social Ranker is great for videos to get natural views, likes, and higher ranking in search engines. Video embeds on social sites have proven to be one of the most effective ways to rank videos. Just copy/paste your backlinks in our built-in online pinging system and see them getting supercharged via 24 ping services almost instantly. Social backlinks, signals, bookmarks or whatever you call them... search engines love these natural authoritative links generated from active social networks. Time for you to dominate those top spots! Drip Feed your campaigns from 1 to 3 days. It's the best way to slow down the link building process to ensure safety and compliance with search engine "good-backlinking-practices". Ranking Higher without spending $$$ is NOW POSSIBLE! as Social Ranker does every single task 100% automatically! Social Link Building - Social Ranker is probably the only social and search marketing tool available in the industry with hands-free powerful link building options on 200+ social sites. There are absolutely no limits on the number of campaigns unlike most softwares. Web-Based Software - Nothing to download, install, update, upgrade or manage.. Isn't it great? Social Ranker is web-based SEO tool which allow you to add and manage campaigns in cloud environment. All tasks are done without captcha API and proxies. 100% Automated - This is truly a hands-free social link building tool where each and every task is automatically handled and delivered. No registrations, manual captchas to deal with, grunt work - an absolutely automated ranking solution. SOCIAL LINK BUILDING MADE EASY! NOTE: After Payment, You'll receive an email from JVZoo with information regarding Account Activation. 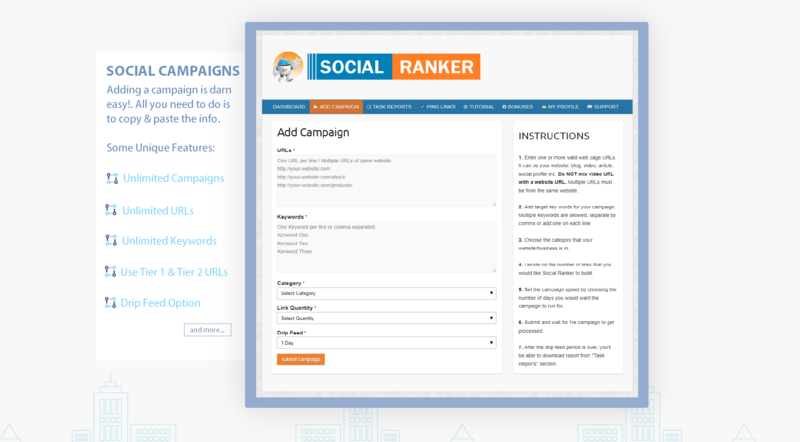 Social Ranker is a web-based social link building tool which offer unlimited campaigns, some of the most powerful automation features, drip feeding, white label reports, built-in pinger and much more! Can I add multiple URLs and foreign keywords? Absolutely. It's as easy as copy/pasting multiple URLs from the same website and adding keywords in any language your website/business is in. You can even mix and use Tier 2 URLs that are different from money site. Do you offer campaign scheduling (drip feed)? Yes, you can set a drip feed period for one or all campaigns from 1 to 3 days. It's not a very big deal though since we're getting links from social websites and at most 200, which is by all means a very safe number. Is this safe to use with Youtube Videos? In fact, we highly recommend using Social Ranker for Youtube videos based on the results we achieved with our clients in last 6 months. Months of testing with 100s of client videos show that Social Ranker is 100% safe for ranking videos. Will I get any campaign reports? YES! Our system will add a White-label report to your campaign once it is completed. You will be able to download a complete backlinks report in Excel format with login info included for each site where the link is created. Can I sell links generated with Social Ranker to my clients? YES! We allow members to run campaigns on behalf of their clients and charge them for those social links. The only thing prohibited is sharing of account details in any way! Do I need to download/install anything? Since the nature of our software is so that a lot of costs like captcha solving, proxies, signups is incurred to automatically process your campaigns, We Offer Full "No Questions Asked" Refunds Within 7 Days of purchase. It means that you'll only get refund if we received the request within 7 days of purchase, requests later than that will not be entertained. 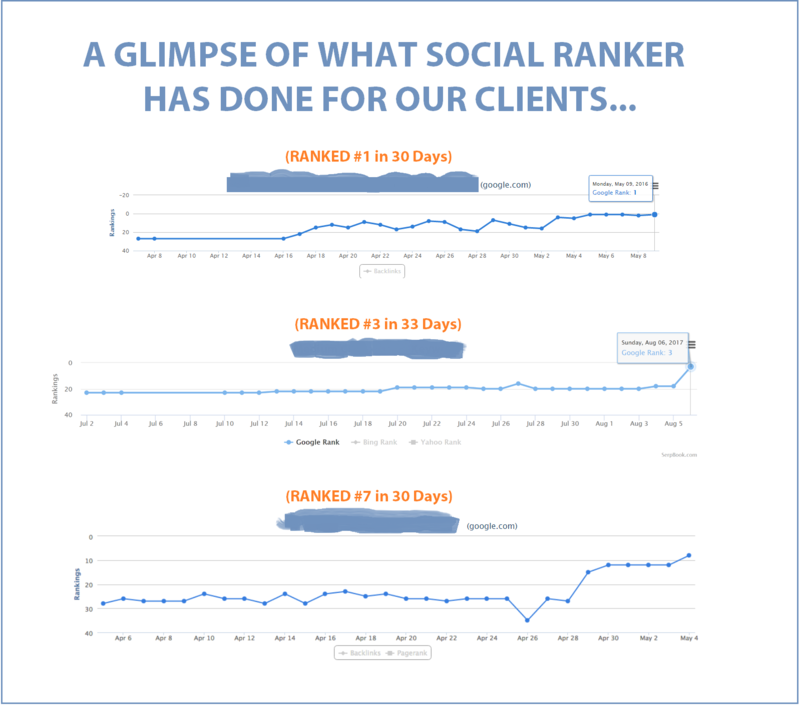 Get Instant Access To Social Ranker Right Now! This site and services offered here are not associated, affiliated, or sponsored by Google or Youtube, nor have they been reviewed or certified by Google or Youtube.